Alice Paillard, manager at Champagne Bruno Paillard: It is probably the experiences abroad, combined with a fascination for the great wine that Champagne can be, that brought Alice Paillard back to where she grew up, in Reims. Before joining the Maison familiale, Alice Paillard prepared herself carefully. Four years at the Dauphine University in Paris studying management and marketing were then completed with a Master of international trade of wine and spirits specializing in viticulture and oenology in Dijon, Burgundy. Through her studies and afterwards, Alice worked in various places such as Venice, London and New York, were she acquired her business experience. These contacts with very diverse cultures combined with the love for quality and the attraction of a young and dynamic company, gave her the will to join Champagne Bruno Paillard and help promoting her family’s wines through the world, in January 2007. It started with getting to know these great wines more intimately, by accompanying them from the vineyard to the final glass: an ambition that needs a lifetime dedication…! She started with a first year dedicated to the vineyards (pruning during the winter in the family vineyard of Côte des Blancs) and the cellar. The following years were more dedicated to the export activities. Alice Paillard, today works as a co-manager alongside her father Bruno. Champagne Bruno Paillard is an independent and family owned House. By Champagne standards, a recent one founded in 1981. Its entire dedication is to demonstrate what champagne has best to offer when lovingly served… Each wine is created by a secret assemblage of diverse crus, grape varieties of course, and often of vintages as well. The Bruno Paillard style is the marriage of elegance and complexity, which translates into a light and smooth effervescence, a remarkable purity, a true freshness and a silky texture. The effervescence has to be delicate. Bubbles are very thin, tiny. They bring to the taster the aromas of the wine and provide the palate with a smooth and creamy texture. Since 1983, Bruno Paillard was the first Champagne producer to inform the wine connoisseur with the disgorgement date on every single bottle, and not only on his prestige cuvée. This tells the consumer of a key moment in the life of a Champagne bottle. Disgorgement is like a second birth for the wine and from that day, a natural process of ageing begins, which is unique to Champagne wines. The aromatic evolution from fruits to flowers to spices is fascinating to the taster. Applauded by connoisseurs, this initiative is slowly being embraced by other Champagne brands. AWP: Champagne bestows a record of ownership from the beginning of its origin. We might say the Champagne drinker and connoisseur is also buying into the romance of that wine’s life. What is it about Champagne Bruno Paillard that makes Champagne lovers connect in such a powerful way? AP: In the Champagne region is it very visible that the story of a House is directly the result of the story of a person. If you think of it, each bottle carries the name of a person! At Maison Bruno Paillard, the name on the label of each bottle is, as always, the name of the founder of the House. It is also the name of who created one style and one blend, as often. What is less common though is the fact that this name also is the one of the current owner and “nez” creating the Assemblage. This unique situation probably answers to a desire of authenticity who ever truly loves Champagne would necessarily demand. AP: That is a tribute to pay to our ancestors. I explain as simply as generations of Champenois families travelled the globe to gain visibility and new markets for their wines at a time when a roadshow to the USA lasted 6 months… this, combined with an internal vision and efficient organization to make the “Appellation” meet the customer’s high expectations. The very beautiful book “Le Champagne dans l’Art” from J.M. Pinçon traces Champagne history through the arts and perfectly demonstrates how, since its early days, Champagne was a selective drink for the wealthy of powerful. AP: It is not one thing. It is a combination of things. A “terroir” is defined by its climate, its soil, and its people. There is no more to say than this. Champagne has a “terroir”, that, because it brought difficulties, provoked its people to extract the best of their abilities. AWP: What is this lineage like for you? AP: This House is a pure creation of my father. Of course our long lineage probably contributed to generate, in a more or less conscious manner, an indefectible and deep respect for what has been built—in the region as a whole—before. It has created souvenirs, it has shaped a taste… Absolutely immaterial and priceless elements that build one person’s humanity… It is probably the roots of this saying my father has always had: “Il faut servir la Champagne et non s’en servir”. AWP: Winemaking in France has been an industry dominated by men. When you entered the industry in 2005, at age 23, what were the challenges and how did you grapple with the cultural differences? How has it changed? AP: The industry still clearly is dominated by men on the producing side, but also on the sales side. Our customers are fine dining restaurants: few are the women who are in head sommelier positions. Although I don’t see this reality changing much in terms of figures, it does seem to change in terms of attitude, communication and probably better in “working together” in my generation. AWP: Bruno Paillard sees the post-disgorgement ageing time as critical for the wine to recover a balance between the freshness and softness of the dosage, to make the perfect marriage. AP: There are numerous side effects on the wine as a result of disgorgement. At the moment of disgorgement, the wine undergoes a sort of trauma, as would a patient who undergoes a medical operation. As a matter of fact, in the language of cellar workers, “to disgorge” is expressed by using the word “to operate”. As a consequence, the first requirement of the wine after disgorgement is convalescence. As with a surgical operation, this convalescence should be longer for an older subject than for a younger one. It is this experience that leads us at Bruno PAILLARD to give a minimum of six months of rest after disgorgement to our Brut Première cuvée and our Rosé Première Cuvéemi, which are relatively youthful wines; eight to ten months for the Blanc de Blancs Réserve Privée Grand Cru and the vintage wines, and up to eighteen months for the Nec Plus Ultra. During the convalescence, the wine will recover a balance between freshness and softness of the dosage, to make a perfect marriage. And after? The wine will pass through five or six “lives”…. The first is dominated by fruity aromas—citrus, red fruits—and where the colour is still pale and the mousse, although fine, is very lively. This is the “age of fruits”. The second period sees a floral dominance: white flowers and roses, and the colour remain pale but the mousse may subside slightly. This is the “age of flower”. The third period is characterized by the accentuation of spiced notes and nuts—almonds, hazelnuts—this is the “age of spices”. To this are added notes of baked bread – this is the “age of toasted”. Finally the wine evolves towards notes of candied fruit, gingerbread, honey and even roasted aromas. This is the torrefaction / candied fruit stage, the stage of fullness. According to the conditions of conservation, this maturity—fruit-floral-spice-toast-candied-roasted—can be short or long. It will still take a minimum of four to five years after disgorging to obtain the first spiced notes, and even decades to attain full maturity. Only the greatest champagnes can offer this path of evolution that real amateurs look for, as they have pleasure in keeping these wines in their cellar among other grands crus. AP: Marketing means observing the market’s desires to develop a product likely to be successful. We do the contrary. We produce a wine we love, and then look around the globe for who would like to share this love with us! It is very demanding, but at least equally rewarding… We work with specialist wine merchants and fine dining restaurants: our customers are people who, in their own work or projects, share the exact same passion for quality and identity than we do. Meeting them on my travels is the best motivation I can ever have. AWP: Is there one vintage that channels everything you love about Champagne? AP: Yes, a multi vintage! By definition, a single vintage cannot channel everything. A vintage is the choice of a specific year, of a specific character… Some are more balanced than others. Some are also closer in style to my personal taste than others… So if I had to pick one, it would certainly be 2002 as I am amazed by the energy, tension, generosity and extreme elegance lying in this vintage. AWP: What kind of Champagne drinker, Champagne connoisseur do we find today? AP: A more and more demanding one. Seeking for information, and transparence, probably more curious too. Having said that, there is a strong paradox and there still is a lot to do: for many people Champagne is a celebratory drink more than a wine. AWP: You are today managing together with your father Champagne Bruno Paillard. Yours is a remarkable investment of your time and talents. Do you have a personal vision for France, its Champagnes and oenotourism? AP: I can only say that France has everything to succeed on that road! At the moment the great adventure of the UNESCO classification helps the Champenois people to be more and more conscious of the importance to embellish our common patrimony. We do need to continue on this road, and progress quickly, as our next door neighbors like Italy for instance have a lot to offer too! AWP: How did your interest in Champagne unfold? AP: Champagne has always been a part of our family life as far as I can remember. It was permanently present not as a day-to-day drink, but in every important moment. Understand: important, not necessarily joyful. It has often shocked people from other regions for example that we open a bottle of Champagne also in the event of a funeral for instance… It may seem difficult to understand, while it is for us very logical: it is an instant of recognition, of reverence, our way to pay homage to somebody. Luckily the vast majority of the tasting occasions are of course positive. But this is to say Champagne was always highly respected and regarded, it was never “a simple drink” at home. I could not write a date in time when I first gave it attention. We grew up as children with a tiny mini glass every Sunday that we would only be able to taste after a full eye and nose description. AWP: What are the great traditional culinary pairings with Champagne Bruno Paillard? AP: It of course depends on every cuvée, but as long as one does not go on the sweet road, many things can work beautifully. Of course the traditional seafood and the “sea universe” will beautifully respond to the minerality lying in our wines. However one can be a little more ambitious pairing them with white meat. Rosé Première Cuvée, for instance, wonderfully accompanies lamb or even pork. This particular wine is perfect to combine with slightly spicy food (safran risotto). Blanc de blancs Grand Cru sharpness calls on oysters or roasted scallops. While a 1999 Nec-Plus-Ultra should be appreciated with a foie grad quail that offers a 360° aromatic sensation a creaminess. AWP: What unique and unexpected Champagne and food pairings have you found in your travels that bring us to new and exceptional flavor experiences? Are you working with French chefs at Champagne Bruno Paillard to adapt combinations discovered from your travels? AP: Travels are wonderful for this: they offer you a different vision, a different angle of what you thought you knew perfectly already! That is how they allow you to fall in love again… Two roads are often approached by foreign cuisine: “the umami” one, and the spices! AWP: What non-French cuisines are making an inroad into pairings with Champagne? AP: The first one that jumps to my mind clearly is Japanese for its refinement and clarity. But we can continuously be surprised with cooking originating from Peru or some of the delicate spices from India! AP: Sommelier is an incredibly complex skill. Of course we can all use our senses, be curious and a little adventurous at home. However let’s recognize each of us has his talent, and we need a talented sommelier to take us one step further, and maybe sometimes to make us exit from our comfort zone! AP: Before anything, they can only bring as much as we let them bring. They are here with their observation of what they think we want, in a service position. So a well-trained sommelier can beautifully work if: a/ he feels that the conversation is open from the customer side b/ the customer is able to describe, with is own words, his desire. It seems obvious, yet it is not. Wine sensations are so intimate that they may be difficult to verbalize. When these conditions are together, then a sommelier will bring to your experience the discovery, will open horizons on some flavors you hoped to capture, and the indicible joy to have learned something new he knows, and that, really, there are some people in the world working hard and well. AWP: What has influenced your own style of pairing Champagne and food? AP: Only taste, and taste, and taste… We constantly try, and in the end, the truth is in the glass and in the falk. AWP: How do you orchestrate Champagne from the apéritif through the meal to its final course? Are there some helpful hints that you’d like to share on this topic? AP: One could write a book from that simple question! It is complex, because there are so many parameters to take into account… the increasing complexity of the wine, its degree of dryness or sweetness, the strength of the vintage…all this to combine with the exact same elements of the dishes. This, without ever forgetting that a meal is a global experience, from beginning to end…that each dish and each wine should respect the precedent and the following. Purely “academically” speaking, in Champagne, one would start at the aperitif with a Blanc de Blancs, gently moving towards wines of higher percentage of Pinot Noir, and as the meal grows in flavour intensity the wines would get older and longer lees ageing. As far as I am concern, the only certainty I have is that I would NEVER have Champagne with dessert. AP: I am glad you ask: so many of them! Before anything the choice of the glass is key… A proper tulip shape glass, that allows the birth and beautiful dance of bubbles from the bottom to the top. With a larger space in its center for a better aeration, and a straighter finish for a good aromatic concentration. Then of course the service temperature is key. It depends on the season and the room temperature, but a good Champagne can be well tasted and enjoyed at 8°. It if it is a hot summer day however, it should be served at 4 as it will instantly gain 2° at service time, and then very quickly warm up in the glass. When the right Champagne is served in the right glass, there is no need to lean the glass. Many people do so thinking it prevents the bubbles from forming a mousse. The truth is: if the glass and the wine are fine enough, it should simply be served delicately in a straight glass. At last, it is important to hold the glass by its foot, in order not to warm the wine. AP: I do not seem to me that expectations are very different on the two parts of the ocean. Except that there probably is a little more exposure to Champagne in France, because there are a lot of entry level priced Champagnes in supermarkets that a majority of people can afford at Christmas, for instance. In terms of attitude, I see a very important one, which is curiosity… It is always in the USA that I encounter great curiosity from aficionados. It seems to me that, once their curiosity has risen on a wine, they would then spend the necessary time to read, search, and learn… While I suspect we might be a little lazier in France… Our country is small, everybody grew up with a vineyard not too far: most people feel like they know about wine just because it has always been there. AP: Absolutely, an art for which I would never thank enough my grand mother for teaching us… Everything, from the place where to seat, to when to seat, who to serve first, when to start… A women is not supposed to serve wine nor serve herself, but should constantly be looked after by her neighbour—a man, of course. Needless to say I happily break this rule with constant application! Rules of course evolve with time and generations… It was for instance considered poor taste to discuss the food you would be eating. Of course this is today very different, particularly when experimenting food and wine pairing, as cooking is looked at as an art and a performance. AWP: Is the younger generation seeking a different kind of taste or lifestyle experience? AP: Probably in a way… There clearly is a desire to taste great quality, maybe in a more accessible and less formal manner, of which the “bistronomy” trend is a good illustration. AWP: What was your first experience that made you fall in love with Champagne? AP: My life counts some extraordinary moments, yes! The great wealth of my professional life is the level of excellence where Champagne Bruno Paillard evolves, generating rich and fruitful encounters. It is my commitment, together, with our team, to continue this demanding road, to constantly stay loyal to who we are, and day after day, and continue creating this circle of aficionados who recognize one another around the globe, whatever their work is, for they are linked by a passion for quality. The wines are classified by alphabetical order, not by preference. Like any great white wine, Champagne it is best enjoyed between 8 and 10 degrees Celsius (48.2 to 50 degrees Fahrenheit), in large, tulip-shaped glasses. And like any fine wine, it is also fragile and needs good care: using an ice bucket is the best way to cool it down. Never forget a bottle in the refrigerator for more than a few hours, the wine would be damaged. Multi Vintage Champagnes: In the Bruno Paillard cellars, “Reserve Wines” are kept in small barrels and in tanks, under the form of the previous years blend. They are each year assembled together since 1985. This very unusual method in Champagne, inspired from the solar system, offers a wonderful consistency at a great level of quality, which Bruno Paillard Multi Vintage Champagnes are recognized to offer. Brut Première Cuvée: Is a pure reflection of the Champagne area because it is architectured on the selection of 35 specific terroirs in the heart of the region. As a consequence it also includes the 3 grape varieties grown in the appellation. Its name, “Première Cuvée” expresses the fact that only the first part of the pressing—the purer—is used. At 60% of the house production, it is the flagship of Bruno Paillard style. Their top quality wine, Brut Première, has to survive any harvest whether rich or poor. Every effort is made to reach this constant quality. The golden straw color reveals the presence of the three grapes and the exclusive use of the first pressing. The fine and smooth bubbles are due to a strict selection of the best grapes, a perfectly controlled temperature in the cellar and a very long ageing. The first aromas of citrus fruits reveal the high percentage of Chardonnay, like lime and grapefruit. Then the red fruit aromas of Pinot Noir appear like redcurrant, raspberry, and morello cherries. While opening in the glass, the wine shows hints of dried fruits, sometimes exotics from Pinot Meunier. Lively entry thanks to a low dosage, the nose is confirmed in the mouth. The first flavors are of citrus, almonds, toasted bread very soon joined by redcurrant jelly, but also dark fruits like cherry, fig and blackberry. While opening in the glass, and getting warmer, the wine expresses light plum and pear flavors. The mouth is full, quite long with a very clean finish. Elegance, complexity, this wine is the exact translation of the Bruno Paillard style. – White wine of Pinot Noir: after a quick pressing, and a fast separation of the skins, the juice is very pale and can be vinified as a white wine. – Red wine of Pinot Noir: is obtained by a prolonged maceration of the juice on the skins. A touch of Chardonnay brings the necessary vivacity to balance the fruits of Pinot Noir. Rosé Première Cuvée has to counterbalance any harvest, rich or poor. Depending on the year, the blend includes a different percentage of “Rosé Première Cuvée Reserved Wines” aged in tanks and barrels. Rosé Première Cuvée spends three years of ageing in the cellar before disgorgement. Presented in a transparent bottle, this wine first seduces with its delicate color. Rosé Première Cuvée: is ideal to serve with poultry and cheese, but will gladly face the challenge of a slightly spiced dish. Its very low dosage make is absolutely incompatible with any dessert or sweet dish. Blanc de Blancs Réserve Privée Grand Cru: Exclusively made of Chardonnay grapes, this wine is also known as “The Lace of Champagne” because of its very fine and persistent white mousse. The Chardonnay grapes of Blanc de Blanc Réserve Privée Grand Cru exclusively originates in the famous “Côte des Blancs.” Aged for 4 years on the lees, this wine also benefits from a minimum of 12 months of extra age after disgorgement. For this specific wine, Bruno Paillard still applies a forgotten wine making technique: during the bottling prior to second fermentation, less yeast is added that in a regular Champagne. Therefore, the fermentation creates a lower pressure. This type of winemaking is especially appropriate for the delicate Chardonnay varietal: it allows it to show all its minerality, finesse, elegance and freshness and balances it with a rarely found creamy texture. It is very pale and shiny with green tints. The effervescence is lighter than in the other Champagnes thanks to less powerful bottle fermentation. The first aromas are citrus, lime and grapefruit, followed by white flowers. While opening in the glass, a touch of almond and toast appears. The entry is lively leading to a complex combination of citrus and white flowers. The effervescence is extremely fine, silky and creamy. The finish is fresh and long. Blanc de Blancs Réserve Privée Grand Cru is fantastic for apéritif and can be a beautiful match with a fish and shellfish meal. Brut Millésimé 2004 Assemblage: Champagne Bruno Paillard “2004 Assemblage” is a blend of 9 villages in the Champagne region, and of two grapes: Chardonnay (48%) and Pinot Noir (52%). Nine years ageing in our cellars have allowed this wine to develop candied fruit aromas, raspberry, wild blackberries, honey and ginger bread, which complement each other in a harmonious composition. The 2004 season: A year with a temperate and harmonious climate, far from the excesses of previous vintage. It is even, relatively dry and cool compared with the decade’s average. This perfect end to the season sealed the destiny of the vintage, with the healthy grapes just needing to ripen. Straw gold with amber lights, bright and joyful effervescence. Vivacious and precise at first, progressively affirming an ample and complex structure. Young and tender fruity aromas—blackcurrant, wild blackberry and very ripe morello cherry—melded with vigorous freshly crushed citrus fruits. Finally with discrete notes of vanilla, quince and acacia honey. On the palate it is full and restrained at the same time, wrapped in the supple flavors of ripe fruits with spicy notes: cinnamon, cedar wood and roasted walnuts. The finish has a zest of candied quince, subtle and long. Brut Millésimé 2004 Blanc de Blancs: The Vintage 2004 Blanc de Blancs was produced exclusively from the first pressing of the purest of grapes selected from the best vineyards in the heart of Champagne. More than 8 years aging on lees in the cellars enabled this wine to reach its full maturity. Very pure, with remarkable finesse and balance between candied citrus fruit aromas and light buttery notes, this great Champagne shows the richness of the year 2004 yet offers a rare elegance. Like any great wine, it should be enjoyed between 2 and 10 degrees and either on its own or accompanying an entire meal. Brut Millésimé 2002 Assemblage: 2002 was a relatively dry year, with approximately 15% less rain than usual. It was rather warm, with a temperate summer and constant warmth leading to an even ripening. September had cool nights and warm days, ideal conditions for optimal grape maturity and perfect health. A relatively low yield brought concentrated and aromatic grapes. The combination of this beautiful maturity and great freshness immediately suggested a potential great vintage. Today, “2002 Assemblage” meets this expectation. This single vintage Champagne “BP 2002 Assemblage” has been produced solely from the first pressing, the purest, of grapes sourced from 8 grands and premier crus from the Marne. Nine years of ageing on its lees gives this Champagne a perfect balance between freshness and maturity. A bright rather pale straw gold color and a vivacious effervescence with very tiny bubbles, it is a bright and luminous wine. The first notes are surprisingly quite salty with an iodic tone, soon followed by fresh almond, then ripe fruits: white peach and cherries, an evolution toward black fruits, mulberry, and some woody, spicy notes. The impression is quite young and vivacious. On the palate is a very fresh taste confirming the nose impression: citrus fruit and spicy notes are dominating, with candied lemon and almond paste. Very vivacious, and long in the mouth. It is a great apéritif, but also a great table wine, which can accompany most classical cuisines, including spicy ones, but not desserts. Brut Millésimé 2002 Blanc de Blancs: This single vintage Champagne has been produced exclusively from first pressing Chardonnay sourced from two Grands Crus from the renowned “Côte des Blancs”: Oger and le Mesnil-sur-Oger. More than 10 years maturation on lees in our cellars has allowed this exceptional vintage to fulfill its potential. The wine has a fabulously complex nose and explodes in the mouth with the diversity and subtlety of its flavors: candied citrus and buttered toast come together perfectly with balanced freshness. The combination of this beautiful maturity and great freshness immediately enabled us to foresee great minerality and a powerful vintage. Today, “Bruno Paillard 2002 Blanc de Blancs” meets this expectation. An intense golden color, with hints of green and very fine beading, the nose is very fresh, yet powerful at the same time with impressive length. Primary aromas are almost salty, with a backdrop of citrus, fresh almonds and floral notes. On the palate it is powerful, both tense and opulent with a long finish. It echoes the salty nose, exploding with candied citrus, frangipane and buttery pastry. Text copyright ©2015 Alice Paillard. All rights reserved. 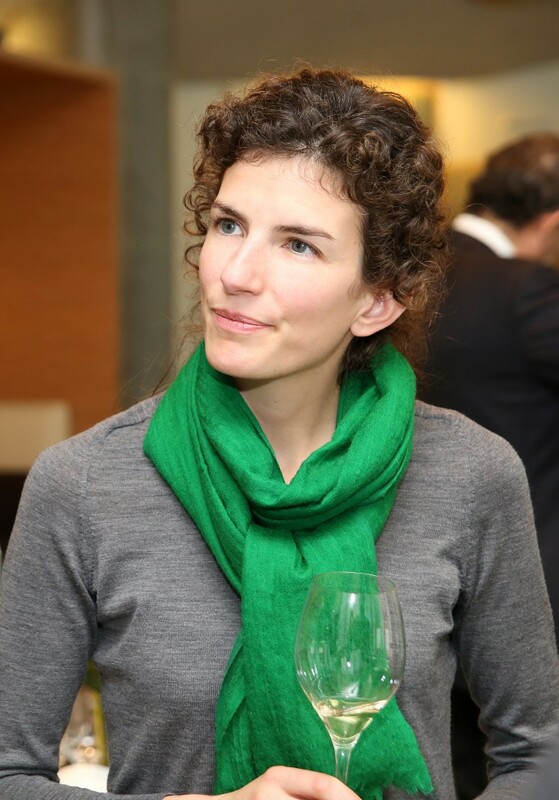 Leave a reply on "Wine in France: Alice Paillard of Champagne Bruno Paillard on the delicate effervescence, remarkable purity, true freshness, and silky texture of Champagne style"